Have you just started your blog and have no clue on how to get more exposure? If so, keep reading this guide and I will show you how you can get more exposure as well as get more backlinks for your blog. 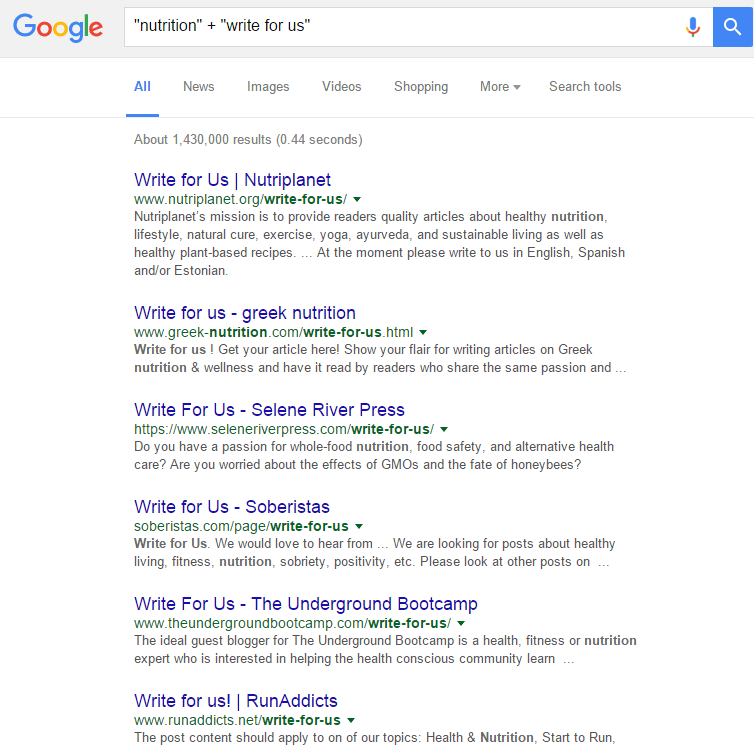 All of the tactics mentioned in this article will not only help you build more visibility, but will also help you get more backlinks at the same time. When you start a blog in a crowded niche, it’s really difficult to gain a foothold. I know how it feels when your competitors get hundreds of thousands of visitors a month, but you get no more than a hundred readers to read your awesome piece of content. Why don’t you get the same amount of traffic? You are publishing as good (if not better) content as your competitors. You are receiving good feedback about your content. But why don’t you get the same amount of traffic? This is partially due to the fact that your competitors have a lot of backlinks and you don’t. And partially because you are probably not utilizing some of the tactics listed in this guide. Follow these tactics and I am sure you will get more backlinks and see better results. Infographics get a lot of love. They are getting really popular. Chances are you have seen more than one. But the question is Will Infographics Work For you? Moreover, Neil Patel grew KissMetrics from 0 to 350,000 visitors a month with the help of Infographics. KissMetrics not only received a large amount of exposure, but also an overwhelming amount of backlinks. 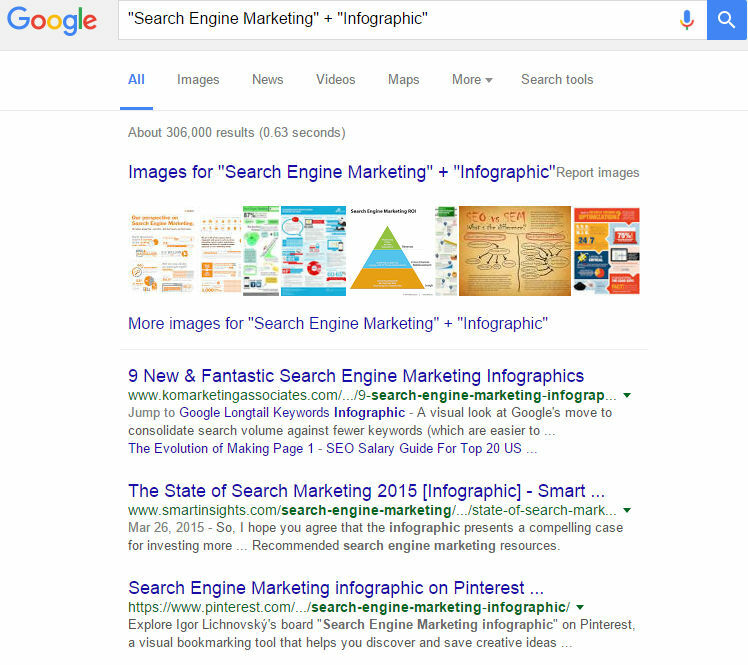 Building Backlinks and Exposure with Infographics sounds easy, right? But getting backlinks with the help of infographics can be a difficult task if done improperly. Choose a topic related to your industry. Hire a graphic designer to create the infographic. Publish the infographic on your site. Share it on Facebook, Twitter and Pinterest. Sit back and wait for people to find and link to it. And I am sure yours looks the same. At first, the above process looks good. But it really couldn’t be more wrong. Your recipe is missing one crucial and probably the most important ingredient. Adding targeted outreach to the process increases your chances of getting more exposure and backlinks. When you create great content, you reach out to relevant people (mostly influencers and site owners) and let them know about your latest infographic. You not only ask them to have a look at your awesome piece of content, but you also ask them for a link or share. The people whom you reach out to are generally the people who already have influence or an audience in the industry. Find an Infographic relevant to your industry that has already done well. Create one that’s 10 times better. Publish it on your blog or main domain. This step is comparably the easiest of all. Figure out a topic about which you want to create an infographic. Then do a Google search for it using this search query: “[Your Topic]” + “Infographic”. On the search results page, have a look at the top results. Find out what infographics have done well in terms of getting backlinks and shares. To find out the number of backlinks each of the top infographics have gained, you can use tools like Ahrefs or Moz’s Open Site Explorer. I will not cover that in this guide. Creating an Infographic that’s 10 times better is not at all an easy task. It takes time and hard work. Don’t copy your competitors’ infographics. Make yours as unique as possible. Try to use a cleaner and more attractive design. Your infographic’s Design and Data is what sets it apart from all others. Make sure to use a beautiful, colorful, and easy to read design. And when you create your infographic, don’t forget to include your Logo and Company name. Now that you have an awesome Infographic, it’s time to publish it.When you publish your Infographic, be sure to provide your readers with an embed code. This Embed code will allow your readers to easily embed the infographic on their own website. After adding an embed code, each time a reader embeds your infographic on their site, you will get a backlink. The tool is really easy to use. 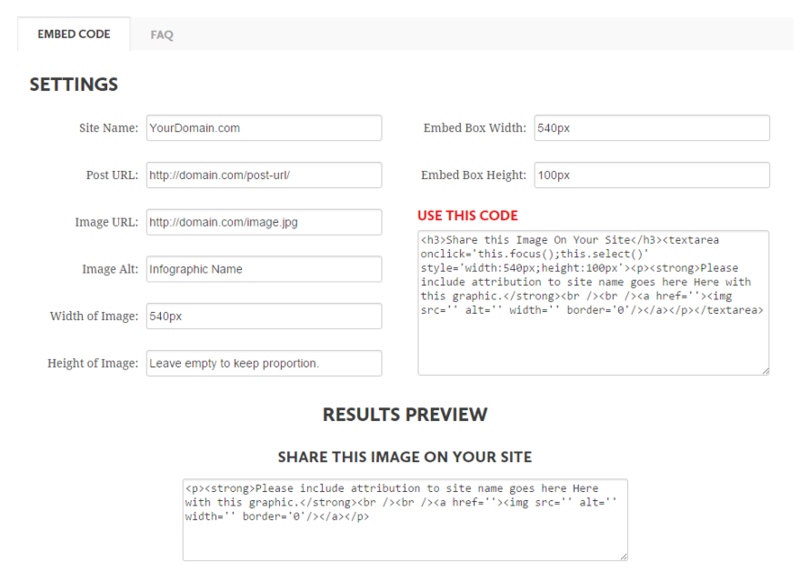 Just fill out the settings, grab your code and paste it right after your Infographic on your own site. Community sites related to your niche. For example, Inbound.org is a community related to SEO and Content Marketing. This is the main part of our process. This is where we let people know that our Infographic exists. Reaching out to people, letting them know about your Infographic, and asking them to link to it is a difficult task. You probably won’t get thousands of backlinks and shares overnight. It will take some time, patience and hard work. To get started with targeted outreach, find all the influencers in your niche and make a list of them. To find the Influencers, you can use tools like FollowerWonk, BuzzSumo, and Ninja Outreach. They are not covered in this guide. 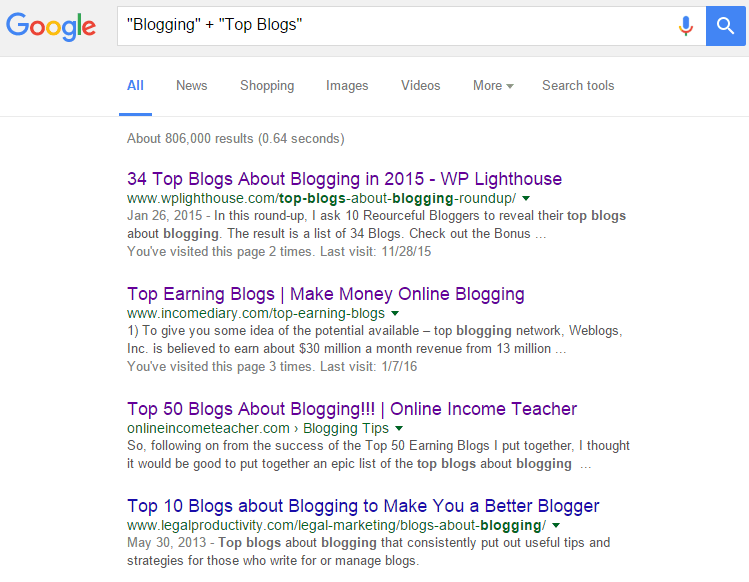 Now, in the search results, you will see a lot of list posts listing the top blogs in your niche. Finding all of these details is easy. I have marked the last four optional. But don’t be lazy. Fill out all of these details in your spreadsheet. The more details you have about the blogger, the better. WordStream has an awesome guide for finding email addresses. This will make it easier for you. Once you have a list of top bloggers and influencers in your niche, you can start reaching out to them one by one. Reaching Out simply means sending them an email and letting them know about your Infographic. Before you reach out to the bloggers on your list, you first need to get on their radar or they will simply ignore your email. Completing at least two of the above tasks will get you on their radar. Warning: Don’t perform all of these tasks at the same time or on the same day or you will look like a fool. Send them a “thank you” email. Sending a complementary email will help you get on their radar as fast as possible. This complementary email will not ask them to do anything. It will be a simple “Thank You” email. Wait for their welcome mail. All bloggers send an automated welcome email to their subscribers. You will receive this email in under two minutes after subscribing. Reply to the welcome email. This approach will save you from writing an additional subject line for the email. And will also improve the chances of your email getting opened. I have been reading your blog regularly. And I really like all the awesome stuff you have been publishing lately. Your article [Article Name] has helped me a lot and I actually got [Benefit]. Just wanted to say ‘Thanks’. You are free to use the above template. But I don’t recommend its use. Instead, personalize the email you send as it increases the chances of getting a response. The more specific details you include about the post, the better (so the blogger knows you actually read it). All these tips will surely help you get on the radar of these bloggers which will not only help you build connections with them, but will also help you in getting them to share your content. I recently published an Infographic on “[Infographic Topic]” and I really think you would like it. Once again, I would recommend not using any templates while emailing the bloggers on your list. Write personalized emails for each one of them. After sending the email, repeat the steps for all other bloggers. This process takes time but is rewarding. Influencers and Bloggers are very busy people. They have a lot of work to do. So, they might take 2-3 days to reply. Don’t get too pushy. If an influencer doesn’t respond or share your infographic, don’t ask them again and again. If you do, your emails will start getting ignored and will end up in the Trash. It is ok to follow up after a week or so. While Google doesn’t give much value to links from Infographic Directories, submitting your Infographic to Infographic Directories can get you a lot of traffic. Submitting your infographic to these directories is really easy. Most of them have simple forms that you can use to submit your infographic. Guest Posts are one of the best ways possible to build an authority in your niche. Why I am calling it the best way? Because it is one of the only ways you can leverage someone else’s audience and build exposure (and backlinks) for your blog. Neil Patel, Brian Dean, and Adam Connell are good examples of bloggers who have used Guest Posting to establish authority. If you read articles on Forbes and Entrepreneur, I am pretty sure you would have come across an article written by Neil Patel. Neil uses this tactic a lot even though he already has such a massive fan following and authority because he knows the benefits of Guest Posting. By guest blogging on GrowMap, I am able to leverage GrowMap’s audience to gain exposure and authority. Guest Posting doesn’t only reward the Guest Poster, but also the site owner. It’s a win-win for both parties. That’s why most blogs (excluding personal blogs) allow Guest Posting. When writing a guest post, the more comments and shares you get, the better. I really recommend you to check out my article on increasing reader engagement on your blog. It will help you get more comments and shares. Now that you know the benefits, it’s time to find Guest Blogging opportunities. The first place to look for Guest Blogging opportunities is your reading list. What blogs in your niche do you read? Chances are most of them allow Guest Posts. Don’t know any blogs that allow Guest Posts? Send them a ‘Thank You’ email. Check the Infographics section for the email script to use. It is better to spread these actions out over a few days. Establishing a relationship with them first makes it dead easy to reach out to them. Getting to know the bloggers first doesn’t guarantee that you will surely get a Guest Post on their site. No one will offer to let you write a Guest Post on their site just because you left a comment or shared their post. Don’t send complete posts to the blogger. Instead, send them an outline of the post along with the title of the post because no one has time to download and read a Word Document they didn’t request. Send more than one idea. It will not only increase your chances of landing a Guest Post, but will also allow the blog’s owner to choose the best Guest Post idea. Include 3 examples of your writing, ideally content published somewhere online. I am [Your Name]. You may remember me from the comment I left on your last post. I really love the content you are putting out on [Blog Name]. Keep up the good work. I recently noticed a guest post on your blog by [Guest Blogger’s Name]. I would love to be the next Guest Author. Let me know if you like any of the above ideas and I will send you a quick outline of the article. Keep Up The Good Work on [Blog Name]! Getting a reply from the blogger might take 5-6 days. Help A Reporter Out (HARO) is a free online service that connects journalists with people who have experience in particular fields. In simple words, HARO helps journalists get more information on relevant topics by connecting them to experts. 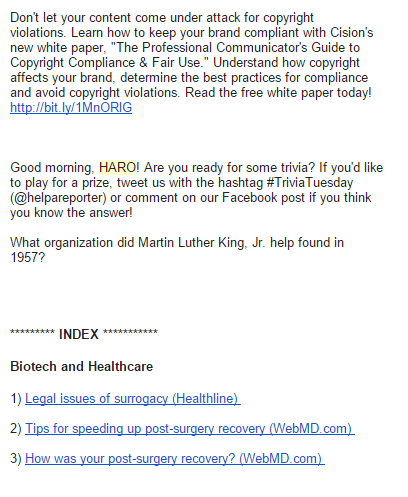 HARO simply sends newsletters containing Media Opportunities to its subscribers. Being Honest, I have never been lucky enough to get a link from HARO. It’s not that HARO doesn’t work for everyone. It’s just that I didn’t try hard enough. HARO has helped a lot of people land High-Quality backlinks from authority sites like Inc.com. And these people aren’t special. They are just like You and Me. Normal People. Getting a backlink with HARO is easy. Just look out for opportunities in the HARO emails you receive. They send out 3 emails a day. Once you find a good opportunity to help a journalist, reach out to the journalist and help them. That’s it. You help the journalist and land high-quality backlinks. It’s a win-win for both parties. Some blogs publish this type of links every month while other blogs live on publishing this type of roundups. If you want to get a link from a roundup published by a high authority site, you need GREAT content. Thin content won’t take you anywhere. While I can’t help you with writing Great content, I can still help you in finding List Posts and Link Roundups. I just read your roundup about [TOPIC]. I really like it. Ready to Get More Backlinks and Exposure? Getting Backlinks and Exposure for your blog takes time, patience and hard work. 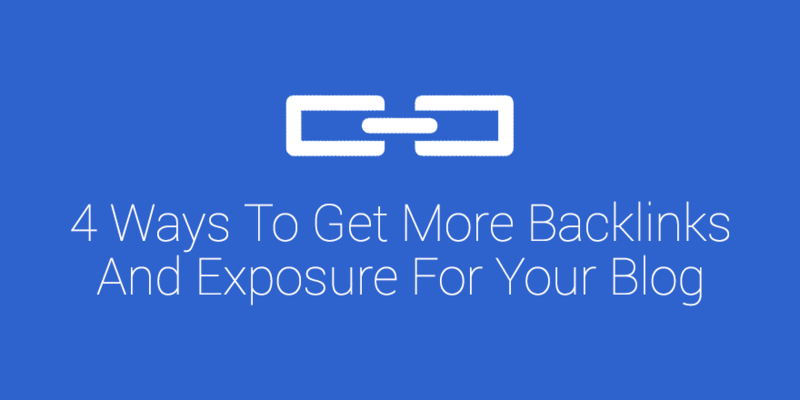 The tactics discussed in this guide will not get you backlinks and exposure overnight. All good things take time. Do you have any questions? Or want to share your own tips? Leave a comment. but with the idea ng a unique infographic. That is a welcomed idea that I will surely abide by. infographic idea was a very cool idea to promote our content in simple way in this post you gave such a great tips to find share infographic in a creative way all are use their social media platforms to gain popularity but you gave that find similar bloggers and tell them about your infographic. Much obliged and one needs to acknowledge for sharing such a helpful article on backlinks.As a matter of fact, I enjoyed the exertion and the method for clarifying the foundation stuff and how to try and google about backlinks.Continue sharing such helpful post. Thanks and one has to appreciate for sharing such an useful article on backlinks. Actually I liked the effort and the way of explaining the background stuff and how to even google about backlinks. Keep sharing such useful posts. Thanks for the article and the email format for guest blogging was great currently using it as well. Keep posting articles like this.Great work!! Ankit Gandhi would love you to read ..Ola Vs Uber: Who Rules the Road? I don’t think infographic is the best way to get more Backlinks. But thank you for your sharing post. Thanks its realy a great post for create backlink with the help of infographic and guest posting. i always read your blog post regularly its really helpfull for my blog. Appreciate for sharing this article on backlinks. I liked the effort you took in elaborately explaining the background stuff and how to even google them. Keep sharing such useful posts. Sid would love you to read ..Arrival, the Best Sci-Fi Film made in a decade! When I searched about building the links through the legit ways, I found this useful post. I agree with the views of building backlinks and yes, I follow the last 3 ways for link building. Thanks for writing the in-depth guide about infographics. I didn’t create it till now. I follow the tips that you have mentioned here and create better than my competitors. 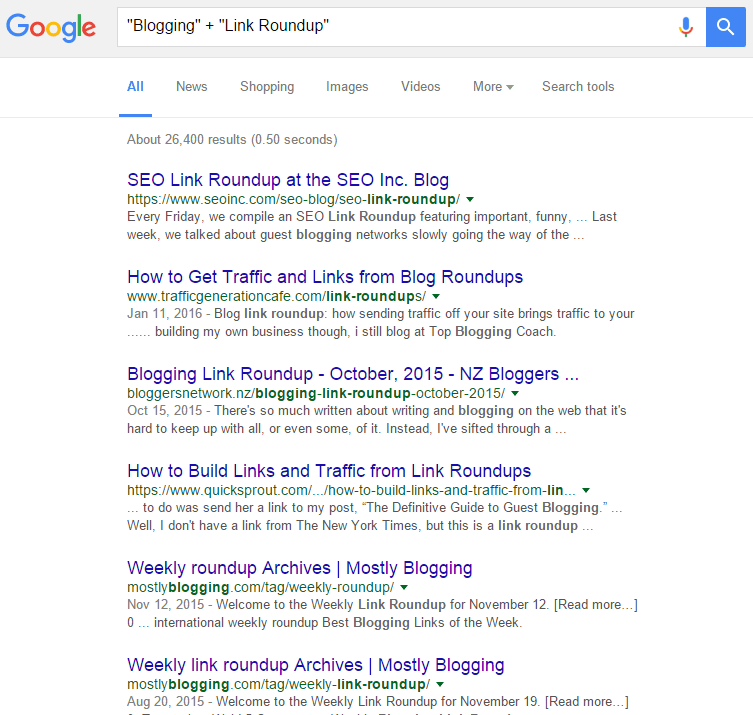 Guest blogging and round-up posts are the interesting backlink methods; I often use them. Thanks for contributing this helpful piece of content for the online publishers to build reliable backlinks. I have just tweeted this post, will do share the details on my network as well. Have a good day! I was searching for some backlinks related post today when I came across growmap.com. Actually, This is very glad to read this informative and motivated post. Backlinks is very important to the sites for the seo ranking. Hope all the bloggers get touch this informative post. Keep posting like that. Have a nice day dude..
Just a heads up. Dont think that Mohits blog is up and running any longer, so it seems you have a broken link there. Dan Hansen would love you to read ..Extra Wide Retractable Baby Gate – Does it exist? Thanks for the heads up. I run the “Broken link checker” plugin and have a VA who fixes and deletes links regularly. But I’m not sure whether it can find them in author bios as that is a separate plugin that allows for those. I’ll edit his bio and he can always let me know if he wants it updated later. How’s business going? I know it can be a real challenge to get ranked and get enough buyers. If you ever have some insights into what you learn along the way and want to do a guest post, just ask. Skype is the fastest way (my username on Skype is growmap) or you can leave a comment. I certainly believe infographics . work well and has helped me gain a lot of reach in social platform . Infographic is one of best way to get backlinks. There are lots of way to get backlinks. You share 4 way. Thank you Mohit for putting so many things in such an amazing way, i have read it and it seems you missed podcast method as it is also very easy and a good way to get exposure as well. i hope you will add something related to it as well. Guest posting is really powerful technique for getting ranked in very less time frame, this is practically proven effective for ranking of my blog – mywptips. Thanks for explaining in such a detail. I want to add one thing that blog commenting and social bookmarking sites are easy ways to get quality backlinks.. Most comment links are nofollowed by default. Some CommentLuv blogs dofollow the CommentLuv link. Some social bookmarketing sites are dofollow and others are nofollow. Info graphic works more then the content or the article because its not time consuming and also attract reader to read. and your article of back links using inforgraphics is very good. link building is very important way to getting good seo performance. Unbelievably, the tips only 4 but its content is fundamental for the bloggers. Thank you for your knowledge. Wau I like this blog post, all of these described methods of Linkbuildings are simply class, must try this which. Thank you for these professional tips. You hit the mark Mohit. This is worth sharing. These are the kind of posts that can help a lot of bloggers, marketers and site owners who just launched their site. Thanks for sharing awesome tips for creating quality backlinks. I haven’t tried Info-Graphics for backlink creation but I’ll surely going to give a try to it. This post is a meaty beast! I actually copied and pasted the text to see how many words to find that there are over 3000! Really enjoyed the read. I thought you put across some excellent tips on how to skyrocket authority and start ranking for relevant keywords. Guest posting is something i’m actively seeking out at the moment as like you said, it is a win win strategy! Ahmad Ben would love you to read ..What Is Affiliate Marketing? I am glad you liked it, Ahmad. 1. Google gives more value to pages with more than 2000 words. Most of the pages on Google’s first page of search results tend to have more than 2000 words. I find guest posting more doable than creating your own infographic. But I agree that both infographic submission and guest posting in other blogs are great source of backlinks and effective way to increase your brand’s online exposure. You are right. Guest Posting is easy, but links to infographics look more natural. And Google values natural links higher. Links from Guest Posts are good. They will surely get you higher rankings, but they aren’t as valuable as natural links. This is because Google can easily find out if your post is a Guest Post. Thanks for your valuable post as you always share. But can you tell me if this technique will also work for personal and company websites? Yes, what works for a blog can also work for a personal or company website. For those who do not have a blog, you must still create quality content on your main domain that will attract links. That means long content (700-1500+ words) that answers a question comprehensively and ideally has links to current statistics writers can quote. When a site has great content, we will quote part of the page and encourage our readers to visit the link to read more. Its seems like a very usefull information. I am new in this field but love to follow these instructions. Very informative post, you focused on each point. Two great free tools to create your own infographic: canva and Venngage which are free. I also think that Guest Posts can work well for any blog, only lately Neil patel wrote Why Guest Blogging is The Best Inbound Marketing Strategy with 62.96% of people perceive blogs with multiple authors to be more credible. I am glad you liked it, James. Guest Posting works in all niches and for everyone. It can help you grow your blog from zero to a million visitors in no time. I’ve already read about a lots of tips about crating backlinks but it seems quite interesting. ‘m working on some of those tips and I’ll seriously work at this one, though it will take some time as I’m quite new to this field. Anyways, One can hire any seller at fiverr at design one’s required infographics. I am glad you liked it, Asher. Of course, you can hire a designer from Fiverr but I don’t think you will be able to get a high-quality infographic design for just $5. Lovely I quickly shared it on my twitter account. Just a suggestion you can add to it when you talked about targeted outreach you may want to throw as much more details as possible because this can key key in terms of seo and backlinks. I am glad you liked it, Usama. You can easily get backlinks from Social Bookmarking sites and Blog comments but Google and other search engines don’t value these links as much as contextual links. One quality link from a high authority site is better than 500 Blog Comment links. Infographics are the best way to attract visitors. Glad that you share ideas for back-linking. Thanks for sharing this helpful information. Target outreach is a very good idea and I like it. Its always good to learn tips like you share for blog posting.I think your suggestion would be helpful for us. I will let you know if its work for me too. i am really glad to read your article you share with us such a informational tips. Thank you so much. swati paul would love you to read ..What is Online Press Release sites and how to use these sites? Backlinks are the best key to gain the traffic to our website and improving the clients. Thanks for sharing this very useful post. Backlinks are most important for search engine result, but backlink should be theme base, high domain authority, high page-rank etc. I appreciate you update. Thank you very much. Everyone out there wants some quality links. And i think that Guest blogging is the best way to earn some quality and dofollow links. The other things you have stated in your post are also good enough to get links but guest posting is my favotite. So, thanks for sharing this awesome post. I am glad you liked the post, Robin. Guest Posting is my favorite too. I don’t wanna be “that guy” but do infographics even really “work” anymore? They’ve been so beaten to death by now… it’s hard for me to believe people even care about them anymore. Actually, yes, they still do if they’re compelling. I still pin a lot of the best ones and often include one at the bottom of a post I’m writing. There are a lot of mediocre infographics and those don’t work. The best infographics contain relevant, current statistics. It can be a challenge to weed out those that are too old. Some infographics get traction on their own, but typically they have to be promoted like any other content created. They aren’t going to get magically popular with no effort. Joining the ERA roundups are great ways to get more backlinks. Thanks to you for sharing this WONDERFUL post with us about HOW TO GET MORE BACKLINKS. I read this complete article and enjoyed it thoroughly. You have discussed valid points and It was so easy to understand word by word. Thanks and keep writing like this. I approved your comment, but wanted to let you know that there are automated tools that plug titles into generic comments and many bloggers would have mistaken your comment for spam because of that. When you comment, always make specific points so that the comment could only fit in that specific post. Otherwise, it will get flagged as spam and deleted – and then you won’t be able to leave comments anymore without them all ending up in spam where they may never be seen. You such a share very useful information regarding back links.